PARSIPPANY, N.J., OCTOBER 6, 2011 - DRS Technologies, Inc., A Finmeccanica Company, announced that the ARMOR™ X7 compact rugged tablet has been approved for connectivity on the Sprint™3G network. This certification will enable ARMOR™ customers that utilize the integrated WWAN capabilities of the ARMOR™ X7 on Sprint’s network to experience the benefits of a seamless data and communication exchange. The ARMOR™ X7 underwent rigorous testing to achieve certification on the Sprint™ 3G network. The rugged tablet met several technical requirements, including: antenna performance, network selection, network impact, regulatory confirmation, and data connection management. “Reliable connectivity is crucial to the mobile workforce. We’re pleased that ARMOR™ has received this certification from Sprint™ as it means that ARMOR™ X7 customers will experience dependable wireless connectivity over the Sprint™ 3G network,” said Mike Sarrica, vice president and general manager of DRS Tactical Systems, Inc.
At a weight of 2.85 lbs., the ARMOR™ X7 compact rugged tablet offers hand-held mobility with a 7” sunlight readable touch screen display. It features advanced wireless connectivity through integrated Gobi® WWAN mobile broadband as well as Bluetooth® wireless, integrated GPS, and 802.11 a/g/n WiFi. The ARMOR™ X7 is specifically designed for mission-critical tasks that require connectivity, mobility, ease of use, and the durability to support all-weather operations. It is certified to MIL-STD-810G for extremes in temperature, vibration, shock and drops, and carries an ingress protection (IP) rating of 65 for being highly resistant to dust and moisture. 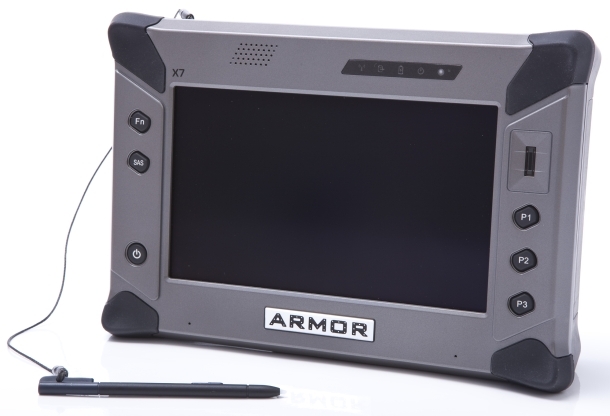 The ARMOR™ X7 features the Intel® Atom™ processor N450 and runs Microsoft® Windows 7 Professional. Other features include energy efficient touch-screen LCD display, new docking system, and new m-SATA solid-state drives from Intel® in both 40GB and 80GB capacities. For more information on ARMOR™, please visit www.drsARMOR.com.